In October of 2012, Felix Baumgartner set a world record by jumping to Earth from an astonishing height of more than 24 miles above it – if he had just waited a while, he would have had a much cooler suit to perform the dive in. 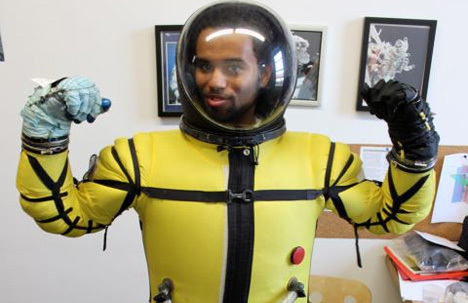 A collaboration between Solar System Express and Juxtopia LLC aims to bring this incredible space diving suit to production by 2016. The suit is being designed to withstand dives from the Kármán line, which is 62 miles above sea level. It has to be able to withstand extreme temperatures, extreme pressure changes, and a complete lack of oxygen. 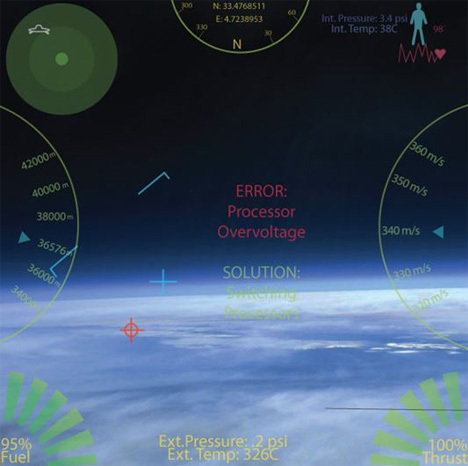 There are so many things that can go wrong on a space dive that the inventors have a huge task ahead of them just to create a viable prototype. The initial tests, set to begin sometime in 2016, will be conducted with a robot, not a human, wearing the suit. That will be one lucky robot, since it will eventually be used to perform sub-orbital and orbital space dives. The suit will feature an augmented reality heads-up display, rocket boosters in the boots to stabilize the descent, and power gloves. The base of the suit is a standard space suit, but it will have to be specially reinforced and enhanced before it can be used to make history. Until then, we’ll just have to watch the scene from the 2009 Star Trek movie where Kirk, Sulu and Olson do an awesome space dive using similar high-tech suits. See more in Space & Time or under Science. May, 2013.